park areas and the fascinating inland region combine to offer the ideal conditions for a relaxing break ! 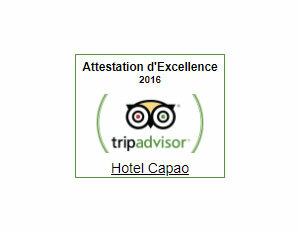 The only Hotel in Cap d’Agde with direct access to the Beach, the hotel CAPAÔ has a unique location. A warm welcome, 55 well equiped rooms, 2 swimming pools (one heated), direct access to our private beach. Don't look for any more : the paradise is here! A three star hotel of reference to be discovered on your next visit !